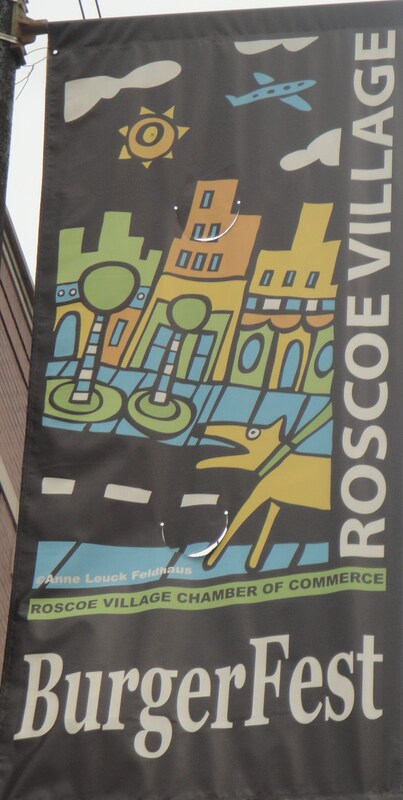 Second time lucky I headed down to Roscoe Village to hunt through the Roscoe Village Burger Fest. This time I forgoed the bus in lieu of a walk to burn off the the extra pounds I would gain from scoffing some burgers. Thirty minutes later walking down from Montrose Brown I hit the gate of the fest to be greeted by a giant inflatable burger and a $6 suggested donation. There is never anything ‘suggested’ about these donations though. At least there was no sun beating down, even if it was still high 80’s, it was a cloudy day and much more comfortable to sample some not so low calorie burgers. Everyone around me said this was the best burger that they had tasted so far. Although it was my first, I suspected I wasn’t going to get a better one and was tempted to cut my losses and head off elsewhere. I have no reason not to go to Butcher and Burger now, in fact I the juices in my mouth are flowing thinking about it as I write. 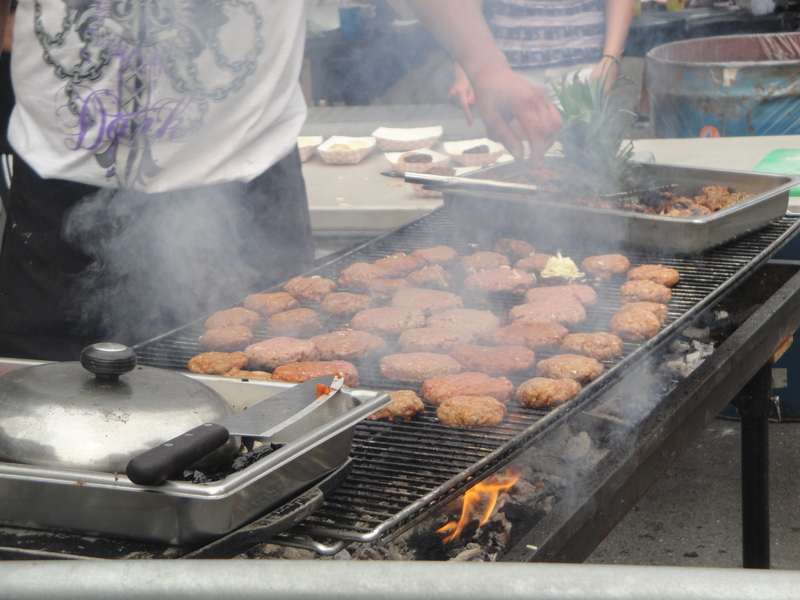 Walking past ‘Reggies’ stand, first the slightly orange burgers on the grill caught my eye then secondly as I looked up at the board the words Chorizo Burgers called out to me. Then when I saw it was just $2 for a small sample sized one, well I was sold. I love chorizo so this should be a no brainer. I was in there like a flash to order one. Apart from the wait and the extra $1 for cheese I was not too peturbed. 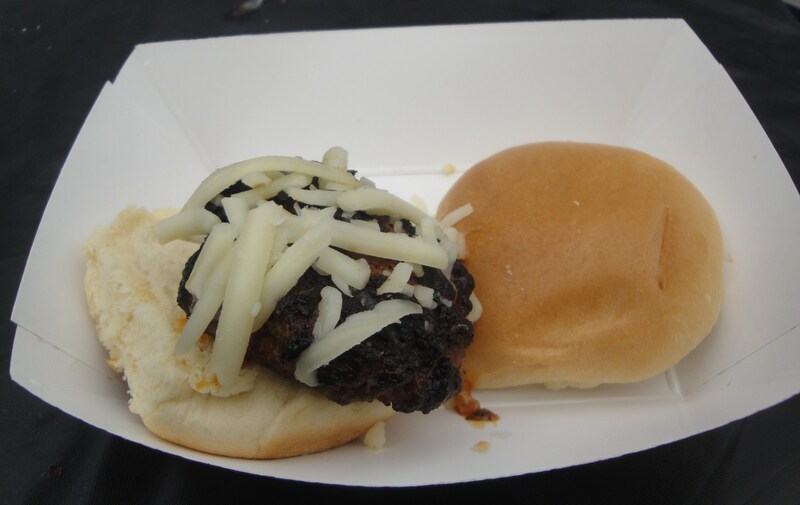 It was not the best burger in the world, but it was OK, I like chorizo so that was its one saving grace. Did I get a dollar’s worth of cheese? 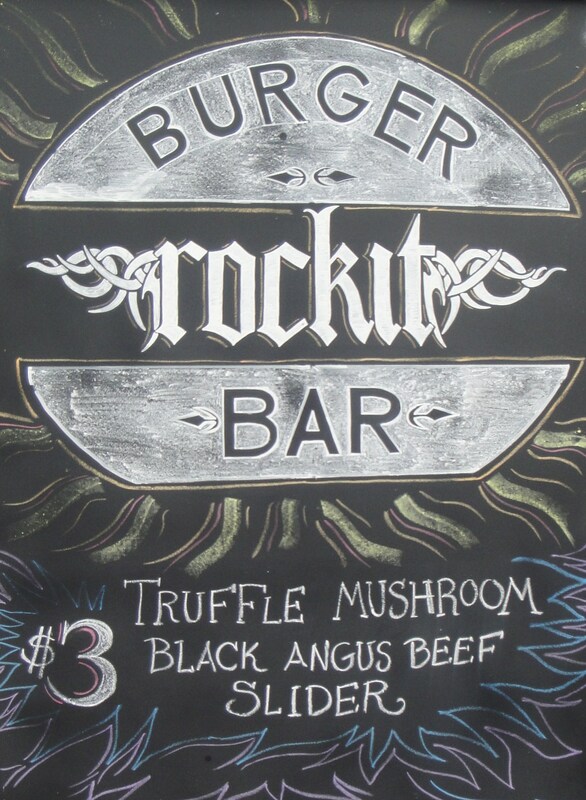 Ok so after that last burger sample, something was needed quickly to pull the burger hunt back on track, and as I passed the Rockit Bar stand I was sucked in by their chalkboard advertising a Truffle Mushroom Black Angus Slider for just $3. Someone had made a real effort on the board so it seemed rude not to make the effort to eat one of their burgers. I can justify this and find as many ways as I can to get my hands on another burger. Although this was just a small slider. It was still perfectly formed as a minature burger. 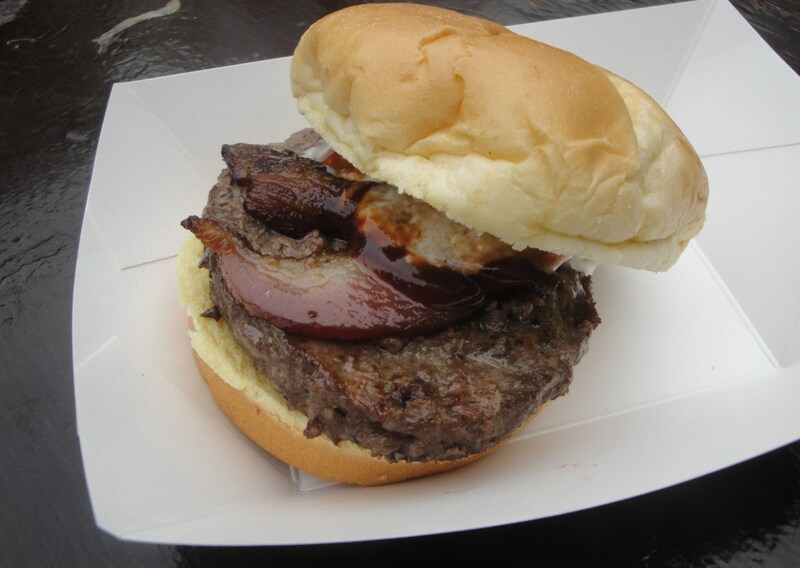 The patty was thick and still juicy, cooked just right so that it still had some meaty juice oozing out on each bite. Sometimes the small samplers just look like an after thought and a way to get more people to try something from their stands, but this was most definately not the case from Rockit’s effort. 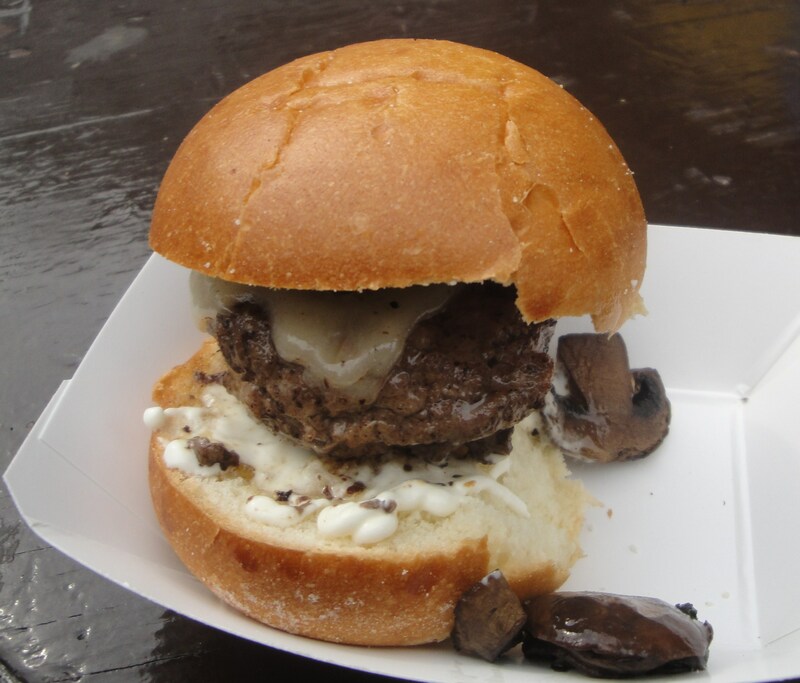 The mushrooms that topped it and the nice mayo sauce were both excellent. This was another burger that prompted a fellow muncher to ask where I got it from. Even though he claimed to be totally stuffed he had to go and get one to try. Rockit Burger Bar and Grill is located at 3700 N. CLARK in Wrigleyville, website at http://www.rockitburgerbar.com/, you can get there via the red line to Addison. After I had located this place on the map I realised that I had eaten here before on an early visit to Chicago after a long session at the Gingerman on Clark Street, yep I will be heading back there soon. 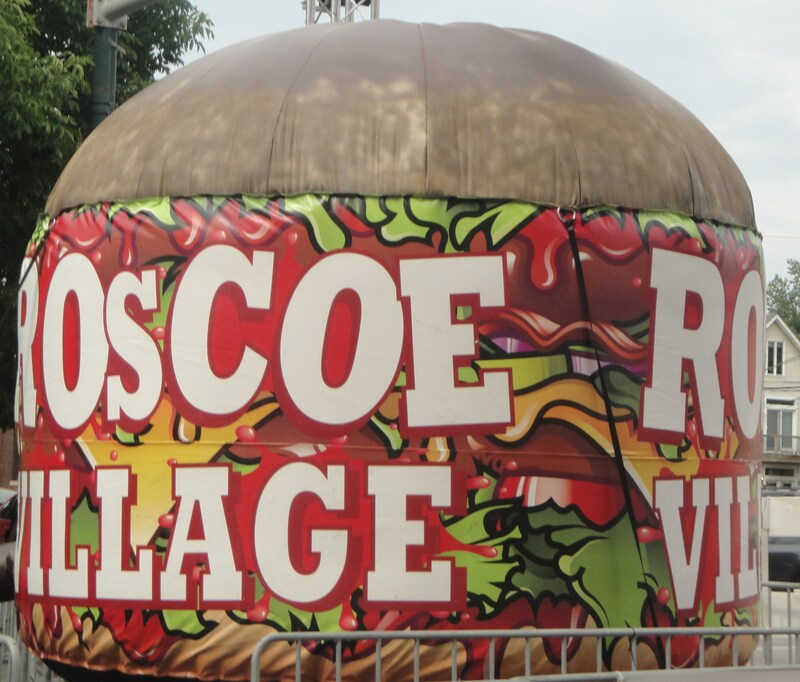 Roscoe Village Burger Fest (21-22 July open until 10pm) has plenty of good burgers to eat, it’s a bit tricky to get to via the El train, but if you really wanted to you can find a way via the cta 50 bus that runs between the Damen Blue station. Although Southport or Paulina are probably the closest. This was my second annual visit and it is now firmly marked down on my festival circuit.